Advocates say wheatgrass benefits your health by providing over 100 nutrients that humans need, including vitamins, minerals, amino acids, and proteins. They claim wheatgrass is a powerful antioxidant and anti-inflammatory that can aid with detox, boost your immune system, and protect you from disease. But are these claims based on real evidence? 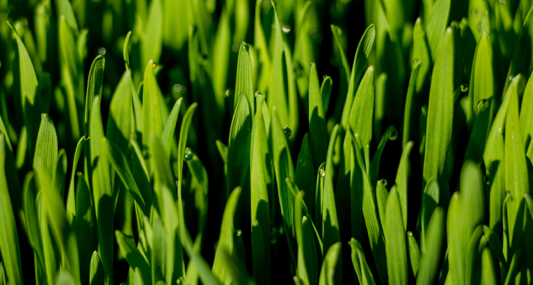 In this article, we’ll examine the research to assess the true health benefits of wheatgrass. We’ll also discuss potential side effects and risks, and the best way to include it in your diet. Wheatgrass is the young grass of the wheat plant (Triticum aestivum). It is native to the U.S. and Europe. Wheatgrass is grown indoors and outdoors. The leaves are harvested seven to 10 days after sprouting. You can grow your own wheatgrass by planting wheat seeds in soil or water and harvesting the leaves. Or you can buy wheatgrass juice, powder or supplements online or from health food stores. Wheatgrass has been used for centuries for its health benefits in addition to being grown for hay and for animals to graze. Champions of wheatgrass say that it is the chlorophyll in the young plant that makes it so good for your health. Chlorophyll is the green pigment in plants that absorbs light from the sun to make energy through photosynthesis. We know that the molecular structure of chlorophyll is almost identical to the molecular structure of hemin. This is the molecule that is essential for the formation of hemoglobin, the protein in your blood that transports oxygen to your muscles and tissues. The only significant difference is hemoglobin has a central atom of iron, whereas chlorophyll is built around magnesium. Our ancestors knew about wheatgrass benefits as they used it for everything from constipation to pain relief. The ancient Egyptians used wheatgrass to boost health and vitality. In traditional Chinese medicine (TCM) it is used for the spleen, digestion, and to help drain “dampness” from the body. In the U.S., the story of wheatgrass really begins in the 1930s when an agricultural chemist, Charles Franklin Schnabel, who was later called the “father of wheatgrass,” fed wheatgrass to chickens that where dying. They not only survived, but they began to lay better eggs than the other chickens. Over the next 10 years, Schnabel carried on experimenting with wheatgrass and by the 1940s was selling a wheatgrass powder in drugstores across the U.S. for use by both humans and animals. 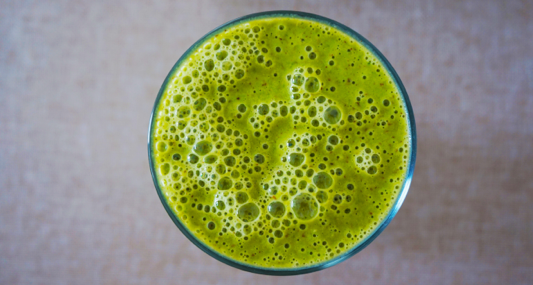 You may still be skeptical about adding something to your smoothie that looks and smells like it came out of your lawnmower. So, what does science have to say about the health benefits of wheatgrass? B-complex vitamins are important for your digestive system: Thiamin helps convert carbs to energy and riboflavin is essential for a healthy digestive tract. This is good news if you suffer from digestive issues such as IBS, constipation, indigestion, bloating, and heartburn. Wheatgrass is high in fiber and enzymes, which are also essential for good digestion. In addition, enzymes help your body to absorb essential nutrients such as vitamins C and E.
Wheatgrass is a good source of protein and contains amino acids, which are the building blocks of protein, including eight that must come from your diet because your body cannot produce them on its own. Protein is essential for building and repairing cells. You need it to build bones, muscles, and cartilage, and it is an essential component of skin, blood, and chemicals such as hormones and enzymes. Some advocates of wheatgrass say that it can be used as a source of all the vitamins and minerals you need, but research is not yet advanced enough to prove this. Wheatgrass benefits include many proven nutritional benefits. But it’s best consumed as part of a healthy balanced diet that includes a wide range of fruits and vegetables, lean proteins, whole grains, and healthy fats. More human studies are needed, but available research suggests the wheatgrass could be an effective antioxidant. Your body needs cholesterol for the production of bile — which is essential for digestion — and hormones that control most essential functions including hunger, mood, and reproduction. But your body makes all the cholesterol it needs naturally, so additional cholesterol from foods high in saturated fats can lead to health problems. More human studies are needed, but the studies suggest that wheatgrass could help lower cholesterol. Your immune system is your body’s natural defense system against infection from minor illnesses such as coughs and colds, to serious autoimmune conditions. If you have a strong immune system, you are better able to fight back against free radicals, foreign bodies, and toxins that can cause illness. This could benefit people with immunity-related disorders such as hematological diseases, diabetes, obesity, and ulcerative colitis. This may be because wheatgrass can boost enzymes that lower blood sugar levels. Wheatgrass has the added advantage of few side effects in contrast to traditional diabetic medications. Iron is essential for the production of red blood cells that carry energy through the bloodstream to your muscles and tissues. If your red blood count is low, your body may not get the energy it needs and you are likely to experience fatigue. Increasing iron levels may also help reduce symptoms of anxiety and depression, and the boost to your adrenal system might help you manage stress better. Because of its chlorophyll content, wheatgrass may help with symptoms of skin conditions — especially those that involve outer and underlying skin layers such as eczema, psoriasis, and ivy poisoning. Advocates of wheatgrass say it can do wonders for your hair. They say the antioxidant and catalase content of wheatgrass can slow aging including reversing graying. Applied topically, wheatgrass may help moisturize dry hair and reduce dandruff. However, other foods contain much higher concentrations of thylakoids, particularly leafy greens such as spinach, kale, and lettuce. In order to get the same benefits from wheatgrass, you’d have to eat it in bigger quantities than the normal intake. Wheatgrass also contains a healthy amount of selenium, a mineral that improves thyroid function. Because your thyroid gland is a key weight management tool, consuming wheatgrass might help you control your weight better. Wheatgrass juice: The raw leaves are crushed and squeezed into a drink, often taken as a wheatgrass shot or added to other health drinks. It can also be purchased as frozen juice. Wheatgrass supplements: Dried leaves are made into tablets or capsules. Wheatgrass powder: Dried leaves are made into a green powder that can be added to smoothies, health drinks, and salad dressings. It is better to choose organic wheatgrass powder to reduce the risk of contamination from the soil it is grown in. 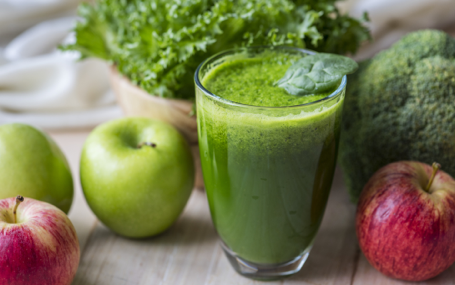 Wheatgrass enema: Wheatgrass mixed with water can be used to cleanse the digestive system. You can also grow your own fresh wheatgrass and add it to smoothies, drinks, and recipes. Wheat grass powder, juice, and supplements are available from grocery and health food stores or online. Wheatgrass can be hard to take as the taste is strong. If you don’t like it, try adding it to drinks with other strong flavors, such as citrus or pineapple juice, which make it more palatable. There is currently no doctor-recommended dosage for wheatgrass. If you’re using store-bought products, read the packaging carefully, and follow the dosage instructions. If you’re using fresh wheatgrass, start with a low dose such as 1 ounce taken with plenty of water, and increase to 2 ounces after a couple of weeks. It’s easy to grow your own wheatgrass. Plus this is the most cost-efficient way of getting access to a daily dose of fresh wheatgrass. Starter kits are available online, or you can buy the products and equipment you will need separately. The soil you choose is especially important. If you get a soil rich in nutrients, you will grow the wheatgrass with the best health benefits. It’s also important that the soil is organic as grasses and sprouts have a high risk of bacterial contamination. For this reason, you should also clean all equipment thoroughly. Watch out for signs of mold as wheatgrass plants can be susceptible to it. Discard any plants that taste bitter or look spoiled. Once you have fresh wheatgrass, use a juicer to turn it into a wheatgrass shot or a liquid you can add to smoothies, water, or other recipes. According to the American College of Healthcare Sciences, see below for the best method of growing your own wheatgrass. Soak two cups of wheat overnight. Fill a small seed tray with soil and pat down firmly with a board. Sprinkle wheat on the soil and cover with a fine sprinkling of soil. Water and cover with a few layers of paper (not newspaper). Once the wheat starts to shoot, remove the paper and put the tray in a warm place out of direct sunlight. Water once or twice a day. It’s ready to cut when it’s 4–7 inches high. Cut only the amount you intend to juice at soil level. When all the wheatgrass is cut, compost the soil and remaining wheat and start again. Wheatgrass may also lower blood sugar, so if you are diabetic you should talk to your doctor before taking wheatgrass. If you are about to have surgery, stop taking wheatgrass at least two weeks before your procedure. Wheatgrass is best avoided by pregnant women, children, and people with immunological disorders. If you are allergic to other grasses, you may have an allergic reaction to wheatgrass. Wheatgrass is also susceptible to cross-contamination and cross-pollination from other plants. If you experience an allergic reaction such as swelling of the throat or hives, stop immediately and check with your doctor. If you have plant allergies, check with your doctor before taking wheatgrass. Some people experience mild side effects, including headaches, nausea and constipation or diarrhea, particularly when taking high doses of wheatgrass as a supplement or juice. Chlorophyll side effects can include cramping and diarrhea. If you experience symptoms such as these, reduce your intake and build up slowly. Wheatgrass is susceptible to contamination from bacteria or mold in the soil or water it grows in. Because of this, it is best to use organic wheatgrass. If you’re preparing it at home, wash the wheatgrass thoroughly first to remove contaminants. Remember, although wheatgrass is generally considered safe, as yet no long-term safety studies have been carried out, so scientists don’t know how wheatgrass might interact with other meds. If you have an existing health condition or take medications regularly, it’s always safer to check with your doctor before starting any program of supplementation. While there have been few human studies on wheatgrass health benefits, the results of animal and test-tube studies are promising. As more studies are carried out and knowledge increases, it is likely that the use of this superfood will become more mainstream. 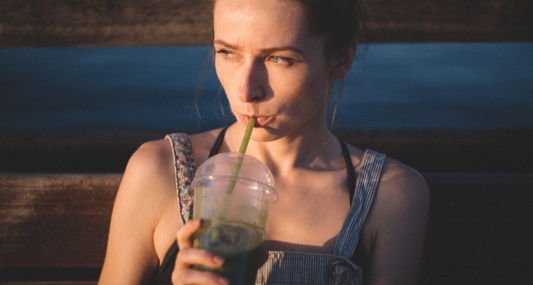 In the meantime, the good news is there is very little chance that you will suffer adverse effects from taking wheatgrass, so if you feel like your nutrition needs a boost, why not give it a try? Have you experienced the benefits of wheatgrass? Do you take it as a juice, powder or supplement? Tell us in the comments!